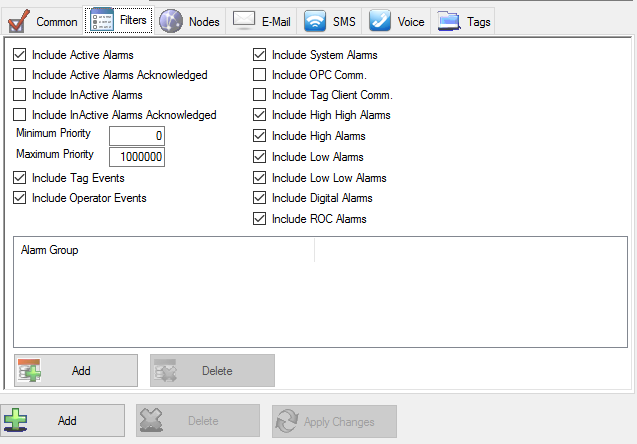 The Alarm Notification feature is used to summarize alarm totals and send e-mails based on specified filter criteria of alarm conditions. 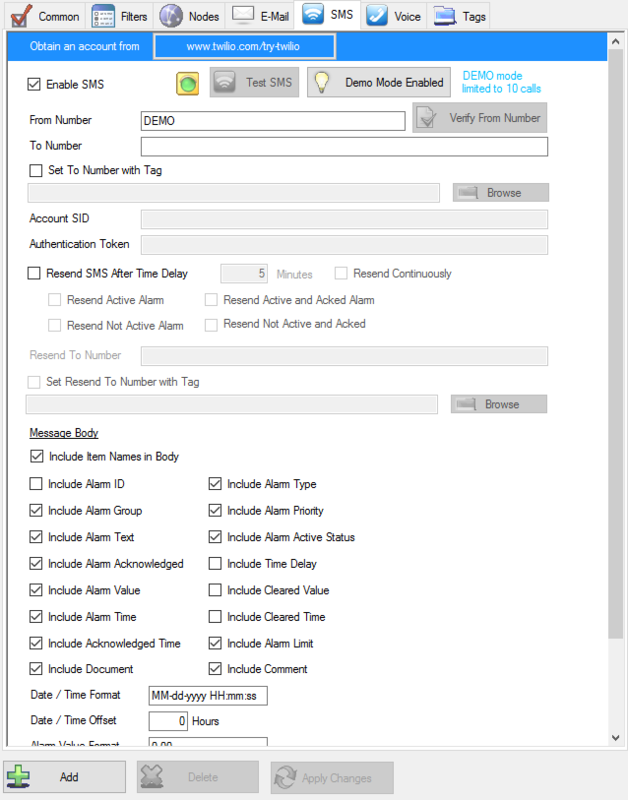 In order to utilize alarm notification you must first define the Tag Alarm Limits as described in Configure Tags of this Quick Start section. 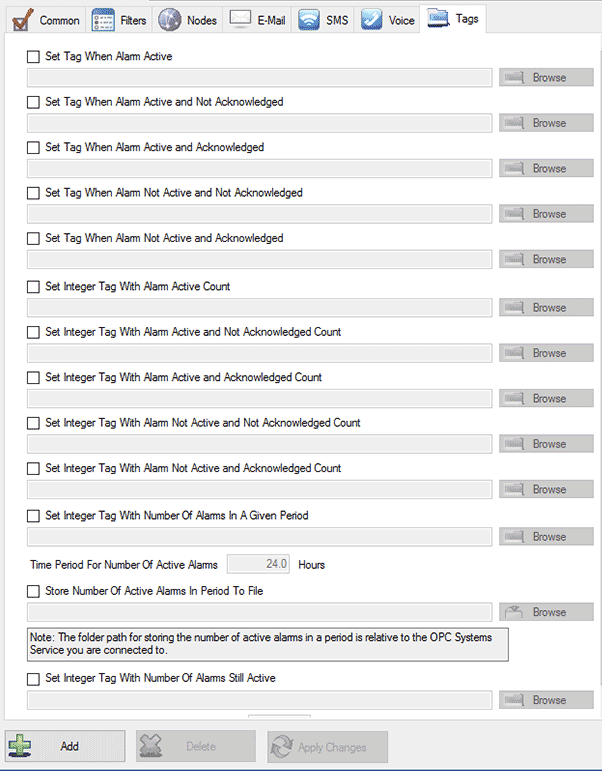 For a complete list of all Alarm Notification properties refer to the OAS Configuration – Alarm Notification section in this help file. Load the DemoTags Tag configuration or use the new Tag configuration you have created. Enter the Notification Group Name of Simulation in the field in the upper right. Check Notification Active in the Common Properties Tab. Notice how you can define filtering based on Alarm Priority, Alarm Groups, and Alarm Types. Select the notification type your would like to set up – Email, SMS or Voice. To use SMS or Voice as a notification type you will need to use the Twilio service. You can define to send alarms that meet the filter criteria to an e-mail account. Use a semicolon to separate multiple e-mail addresses. To trial the functionality you can use the demo mode to send 10 notifications. To use SMS as a notification type you will need to use the Twilio service. To trial the functionality you can use the demo mode to send 10 notifications. To use Voice as a notification type you will need to use the Twilio service. With the Tags properties you can assign to automatically write alarm statistics to Open Automation Software Tags. Useful to drive an external alarm horn through a PLC or display how many alarms are currently active. Select Configure-Tags and add a Boolean Tag with the name Alarm Is Active. Add an Integer Tag with the name Number Of Alarms Active. Add an Integer Tag with the name Number Of Alarms In Last 24 Hours. Assign the Tag name Number Of Alarms Active. Select the Add button in the lower left to add the Alarm Notification group. Save the file DemoAlarmNotification.AlarmNotification in the directory C:OPCSystemsDemo. 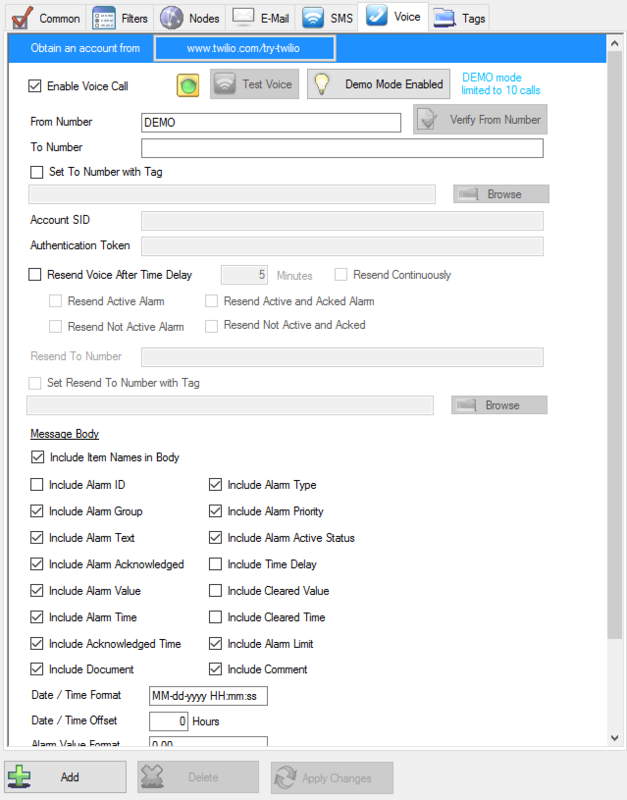 Return to Configure-Tags and select each tag and note that the current number of alarms and active state are updated automatically to the appropriate tag.